Beautiful ivory silk lanterns and white wedding cake. The beautiful setting with silk lanterns in the late afternoon made a very elegant and romantic ambiance. 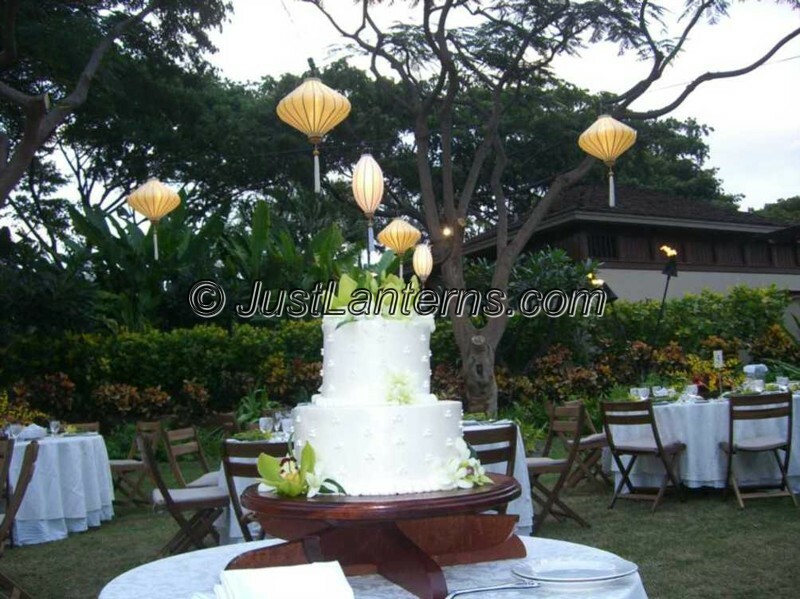 Lanterns used A39L and E39 Hawaii Event Lighting offers indoor and outdoor event lighting for all types of special events in Hawaii. They specialize in lighting for events of all sizes and for all budgets. Tent Lighting, from minimal to over the top. Designing and producing the original stage lighting for The Gathering of The Kings by, award winning, Island Breeze Productions, Inc.. Pro lighting design is the passion at Hawaii Event Lighting. They provide outdoor lighting for weddings, luaus, in addition to concerts and stage lighting events. Illuminate your floral decor, signage, and props with unique, outdoor lighting effects. Hawaii Event Lighting achieves the bold event lighting you are looking for.